This picture of the high school, drawn by Kathy's Dad, was used on .Ray High School stationary. Mr. .Case also took pictures of downtown .Ray. These have been distributed to others including the museum in .Florence, AZ. (I asked Kathy where the HS was --ovk) The elementary school was .Lincoln Elementary. Straight above, about a mile walk, was .Ray High School. The two schools were connected by an old trail with stairs that many kids used. Later a shorter trail, sort of paved and straighter, was built. Kathy graduated from the Ajo High School class of 1967. 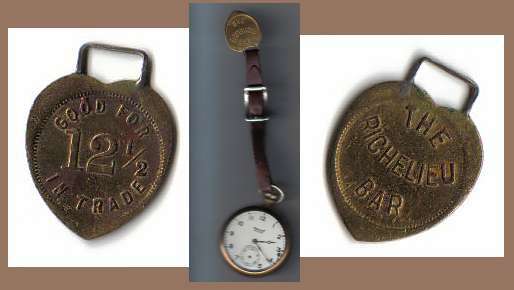 Dusty writes that there was a bar in Ray, the Richelieu Bar, that offered tokens to patrons. His Dad, Arthur Eugene Tibbs, converted the token to a watch fob. After his service in the Marines he had gone to watch maker/ jewelry school, but moved from his birth place of Poplar Bluff, Mo. and went to work in the mines. He worked in the Ray Mine nearly 40 years, until it was shut down by Kennecott. He served as a gate guard during his final days of employ before taking his retirement. Dusty shared several other mementos with us. This first is a safety award. 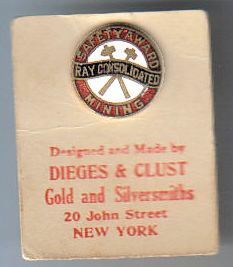 The text is " Safety Award, Ray Consolidated, Mining." 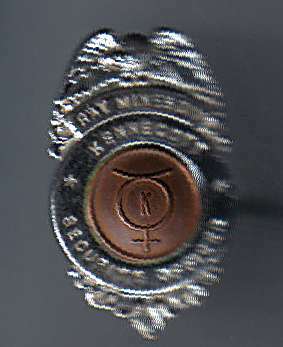 This badge has the words Ray and Kennecott and Security but the others are illegible. The central symbol's meaning is unknown. KW Dart is on the front; Certified Operator is on the back-- of this watch fob earned by drivers of the huge ore haulers. Her mother in law had moved into a house in Clarkdale in 1916, lived there until she died, she had moved from Phoenix when her husband started working for the mining company in Jerome/Clarkdale. She brought with her, her Grandfather Sam's things, he was civil war veteran and a Tombstone gunsmith. He was there when they had the shoot out. 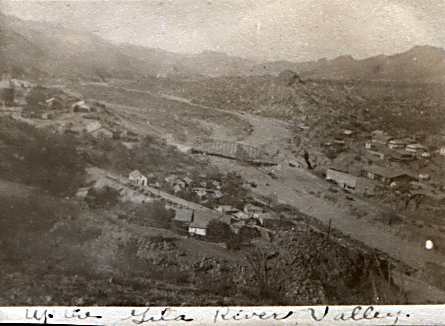 Her father Philip was an amateur photographer who had live in various Arizona mining towns. So there were things dating back to 1850. He had saved his fathers things and added a lot of his own to be saved.The son died and his wife wanted to get rid of all the 'stuff' in the shed that had been sitting there since 1916. I know the historical value of old papers and photos and wanted to be sure they were saved. I also know how much stuff is trashed by relatives "cleaning out". The panoramic is in bad shape. I did manage to steam it open and scan it and haven't touched it since. Some of the photos that we found are so great, it blew me away. About 80% of the things were old books. So fast forward 2 years when I happened to watch a PBS story on Sonora and Ray and thought, I have pictures of Ray! Did a little research and could not find the panoramic shown, found your web site and here I am. Are you the Ray historian? I was born in Clarkdale in 1934 and love Arizona history. It looks like the town was still being constructed. When would that have been? There are six photos that I haven't scanned yet. A couple are of mine equipment and the rest are landscapes. On one of the photos is written Ray 1920(?) Philip was so good at dating and identifying all the rest of the pictures, but he seems unsure of the date on the Ray photos. I am delighted to be able to share that photo! Closeups and discussion of parts of the panorama. "Hi. I am in the process of scanning photographs belonging to my parent's and grandparent's. 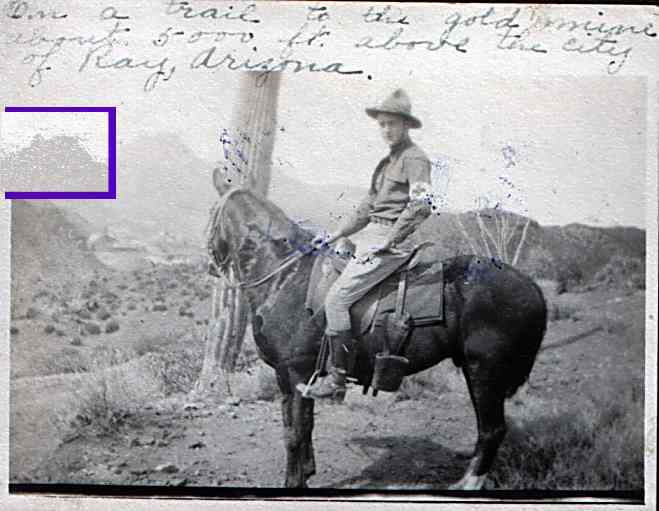 There are 4 photos that I've come across related to Ray, AZ and the Hercules Copper Mine. The photo album contains pictures from 1917 and 1918, though I don't know if these particular photos are from those years. ...." 1/27/2009. 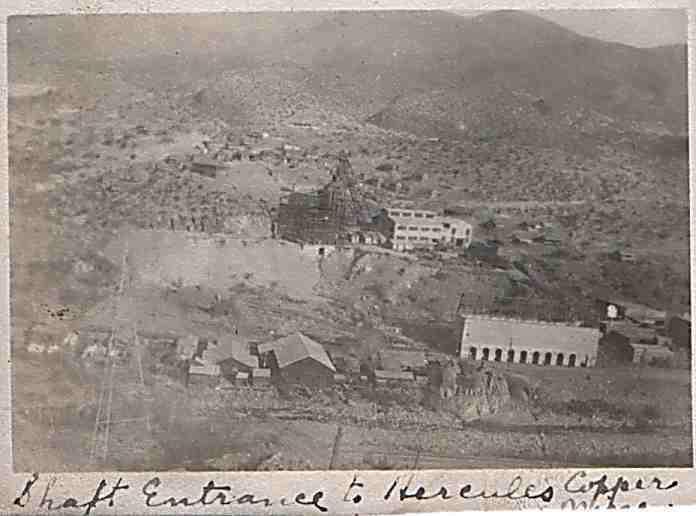 Caption: "Shaft Entrance to Hercules Copper Mine" Here-evidently under construction. By 1944 mill and elevator were abandoned and was a playground for some. Several of us were swinging on a knotted rope in the elevator. John McCormick fell from the swing and walked painfully home - a mile. (Broken hip! I believe two of us helped-one under each arm.) Downtown Ray is at the lower right. 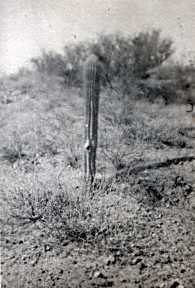 Caption: "Species of Giant Cactus in Arizona"
See Tommy's page--pictures and text of 1962-65. 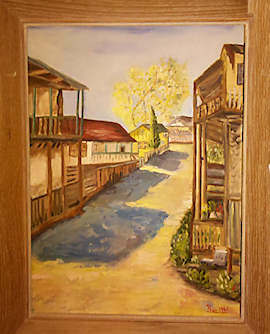 An excerpt: " There ( in Sonora) was a clothing store owned by Kelly Haddad, who was Lebanese and greatly loved by all in Sonora. He was also the Justice of the Peace,.... "
Song entitled "Sonora" honoring its past. An excerpt: " They dug for the copper 'til the land was forsaken, Then they wrote it all off as the progress of man." 1931 Commencement Program-Ray HS, including graduates names and dignitaries. Diane, with no direct relationship to Ray-Sonora, was kind enough to send the Program. Albert Ruiz has been painting for quite some time now and he sent me (Tess) this (the left) painting. He wrote, "To everyone who remembers September 16 at the skating rink in Sonora, Arizona. 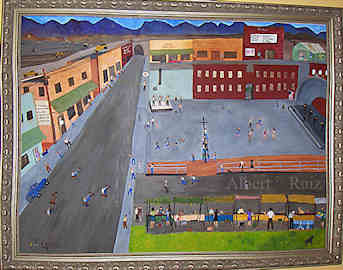 (Ray High School is in upper left-hand corner)"
The right picture, Sonora in 1961, is discussed. And info about the painter requested! Theresa Ozuna - in an email. Pictures, name link to larger view. 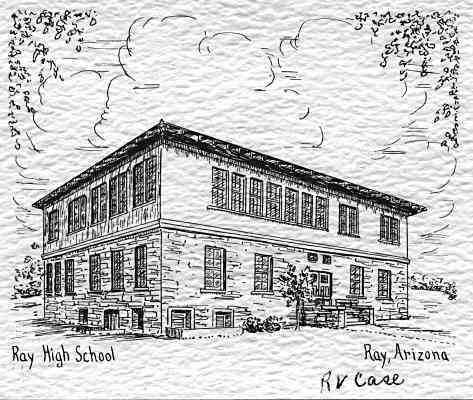 My name is Terry Hall I lived in Ray from 1950 to 1960 when we moved to Superior, AZ. I have many memories of Ray one of which concerned the “Old Man of the Mountain” My father was a Drilling foreman and remember him telling me how they were drilling the old man to blast it down. They drilled for several weeks and then Pete Perez and the blasting crew loaded all the holes. Pete hid under an old underground ore car and set the charge off. It was the largest single blast recorded up to that time in AZ. I remember it well we were at the old baseball diamond when it went off. Scared us all to death. When we first got to Ray we lived in the old hotel. Then Noel Wilson in Kelvin offered for us to stay in his home until we were able to live in a little home owned by Mr. Chambers who was Postmaster for Kelvin with a small store there. Then we moved to Thomas Terrace in Ray. Afterward we moved to Teapot Terrace lived there till we moved to Superior. Many summers were spent climbing Teapot Mt. and swimming in the Ray swimming pool. I lived in Ray briefly, from January of 1942 to May (or whenever school was out), 1943. My mother, my toddler sister, and I lived in Ray and my mother taught elementary school in Sonora. My name was Nea McComb, my sister was Judy McComb, and my mother was Mrs. Ruth McComb. My parents divorced and my mother had to go back to college to finish the teaching degree she had started some twelve years earlier. She chose to do that at the college in Tempe. I went to Fourth Grade and the first part of Fifth Grade at Tempe Elementary. Since my mother was anxious to begin earning a salary, she went to class all year around, and because of that she finished her degree in January of 1942. January is not a prime time to be looking for a teaching job, but she did find one in the Ray School District. So we packed up all our worldly goods, put them into my uncle's pickup (we still didn't have a car), and trudged up the mountains to Ray, Arizona. I remember we arrived in the midst of a horrible rain storm. The locals said it was the worst storm they had had in many years. What a welcoming! As I recall, Ray had three hills where there were homes for people to live in. They were called Townsite, Boyd Heights, and I can't remember the name of the third hill (Zachary Hill - ok). Apparently arrangements had been made for us to have a place to live, as we moved into a little apartment. I can't remember which hill it was on. Looking back on it now, I think the place had once been a one-family home and later someone had made it into two small apartments -- with only one bathroom!! As soon as Christmas vacation was over, my mother started her new job. She taught an elementary grade in Sonora. I don't remember what grade, but I would guess maybe Second or Third. Apparently the teachers all lived in Ray, and every morning a bus would take them over to Sonora and bring them back to Ray in the evening. I'd like to say here that in those days married women were not allowed to teach school. I don't know if was because "a woman's place was in the home", or "she would take a job away from a man" (Yeah, like thousands of men are lining up to teach elementary school), the students might find out what married people do, or, God forbid, they might have a pregnant teacher. I guess the rule must have been relaxed as Ray seemed to hire divorced women with children. Maybe it was because there was a war on and they had to hire them or do without. Well, at least they weren't married! I started the second part of Fifth Grade. It soon became obvious that the Fifth Grade curriculum in Tempe didn't quite correlate with the one in Ray. In due time, I was told that I would be going back to Fourth Grade. The adults in charge must have done a good job selling me on the idea, as I don't remember any bad feelings about it. In fact, I was probably relieved, as I no doubt knew I was in way over my head. I finished Fourth Grade and completed Fifth Grade in Ray with no further problems that I can remember. Very soon my mother met two other divorced ladies with children who lived in Ray and taught in Sonora. They were Mrs. Alice Nelson (with her daughter, Connie) and Mrs. Ann Cox (with her daughter, Freddie, and her son, Walter). The three of them became very close friends and stayed friends for many years afterwards, even after each of them had left Ray. My mother is gone now, so is Alice, and I presume Ann is, as well. Since Connie, Freddie, and I were about the same age, we kind of hung around with each other. I was closer to Connie than I was to Freddie. I was the Maid of Honor in Connie's wedding when she married Lamar Haines, who was from Globe. We are still friends and keep in touch with each other. Of all the friends I have, she is the friend I have known the longest. Had Connie and Freddie remained in Ray, they would have been in the class of 1949. After we left, Connie and her mother, Alice, moved from Ray to Globe, Arizona, so Connie graduated from there. Also, after we left, Ann remarried and she, with her children and her new husband, moved to the Litchfield Park, Arizona, area. I think I am right when I say that Freddie did not graduate from Ray. Unfortunately, I have not heard about Freddie and Walter in many years and know nothing about them. I don't know if the previously mentioned apartment was intended to be only temporary, but it wasn't long before we moved into a different one. It had its own bathroom! It could be said that it was a two-story building, but since you know the topography of Ray, you will understand when I say that the front door of each apartment was on ground level. We lived on the top floor and Ann, Freddie, and Walter lived on the one beneath us. Later we moved to a larger place on Boyd Heights. It had a nice fenced front yard and an alley in the back. I think Mary Palmer lived a few doors away and we spent time together in the neighborhood. I think Judy Michea (sp?) lived across the alley from us. I joined the Girl Scouts and I can remember walking to town to attend the meetings. It seemed like a long way. If memory serves, we met in a vacant store downtown. (Boy Scouts used the same building-ok) I also remember walking to the movie theater by myself, watched the show, and walked home again. The price of the movie was 10 cents; when you became 12 years old you had to pay 44 cents. Never mind the difference in price, can you imagine kids walking all over the place now like we did then? My mother remarried December 25, 1942. Shortly before we all went back to school after Christmas vacation, my mother, being the natural-born rule-follower that she was, went to Mr. Hibner and told him she was married now and would have to resign from her job. He said she could keep it. I guess there was still a teacher shortage there. We moved from Ray in the summer of 1943 to a farm near Chandler, Arizona. …. Although I lived in Ray for only a brief time, my experiences there impacted my life in several ways. I began a life-long friendship, I learned how to cope with a potentially humiliating circumstance, and I gained a new step-father who later gave me two little brothers. … I " remember the two story abandoned brick shell with the baby cottonwood trees growing inside. I always wondered what the building had originally been. I thought maybe it had been a hotel. I remember I would pass that abandoned building as I was walking somewhere. I must say, though, that I had no experience with dynamite or blasting caps. I think that was a boy thing. But, believe it or not, I do remember Medical Doctor. C'mon, now, who could forget a donkey named Medical Doctor?!! I went to college in New Mexico, where I married my husband. We were both preparing to be teachers. My husband grew up in Hurley, New Mexico, another Kennecott company town. He had a good childhood there, much like the Ray boys, with donkeys coming to town, climbing mountains, and fording streams. He has many fond memories of growing up in that small town. Russ Cooper (Ray Class of 1969) said his parents had grown up in Hurley. We were wondering what their first names were. I don't mind if you give him my email address. You know, Kennecott always had twin towns, the mine town and the smelter town. Hurley was the smelter town and Santa Rita (( http://en.wikipedia.org/wiki/File:Santa-Rita-NM-1919.jpg)) was the mine town. Santa Rita suffered the same fate as Ray, in that the town was destroyed when the open-pit mine was expanded, but I think it was a little earlier than Ray's demise. I know this is way too long. Edit as necessary. Assembled by ovk. Last updated 01/25/2012.